Passports In Art - Yanko Tihov - Passports Are Art! Passports In Art – Yanko Tihov – Passports Are Art! Passports In Art – Yanko Tihov – Passports Are Art, especially when it comes to old travel documents with their colorful stamps, seals, revenues, handwriting and of course the passport picture. 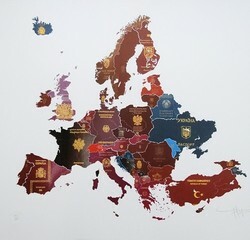 I already introduced other artists involving passports in their artwork today I like to introduce Yanko Thiov. Yanko Tihov is a painter and print maker who trained in Sofia and works in London. His work is broadly autobiographical, characterized by his willingness to explore human nature through different series of figurative and surreal urban work as well his newer series of works inspired by history, immigration and changes to the world map. 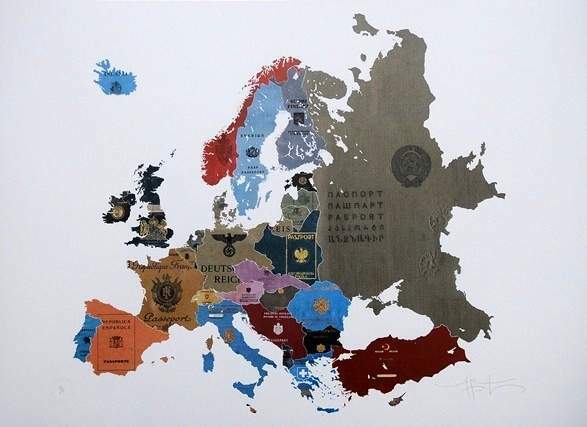 In his passport series the design is determined by the colors and motifs of each country’s passport, which the artist carefully matches and re-creates within the correct national borders. Tihov has hand-painted the texts, seals and coats of arms which adorn the covers with real 24 carat gold, successfully capturing their individual details. The paint adds a unique layer to each work which beautifully reflects the light and enlivens the surface. 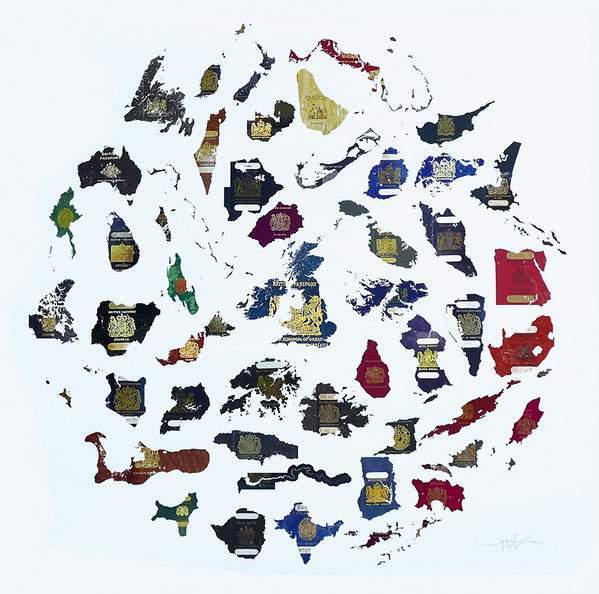 Overall his passport series serves as both a reminder of the laws and jurisdictions which bind individuals, and offers unique examples of contemporary cartography which beautifully captures the borders of today’s world. Look at these three art samples which are somehow my favorite of his passport series. I love the British Empire passport map as it shows how huge the British Empire truly was as it spanned the whole globe. Collecting passport from the British Empire is one of the most exciting collection fields a passport collector can choose. Many of these states are extinct nowadays and it´s sometimes pretty difficult to find passports from these former British territories. I give you an example. NORTH BORNEO was one British territory and so the had this classic blue passport. I only saw ONCE such a document in more than 13 years of passport research and collecting. I know where this super rare passport is located and I hope in future I can convince its bearer to give it to my archive. However I know its a family document belonged once to his grandfather so I fully understand when it remains within the family. By the way, Yanko did you included NORTH BORNEO into your map? I know it´s maybe too tiny to be visible. This Europe 1930 passport map is also very interesting to see as it shows the nice old covers of the passports. Also during this time we can find some countries with attractive passport design. The Danish passport for example was quite a huge passport even it was already in booklet form. 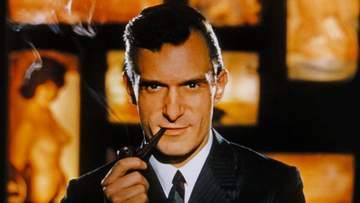 Denmark 1933. The size was more than twice as big as our passports nowadays. 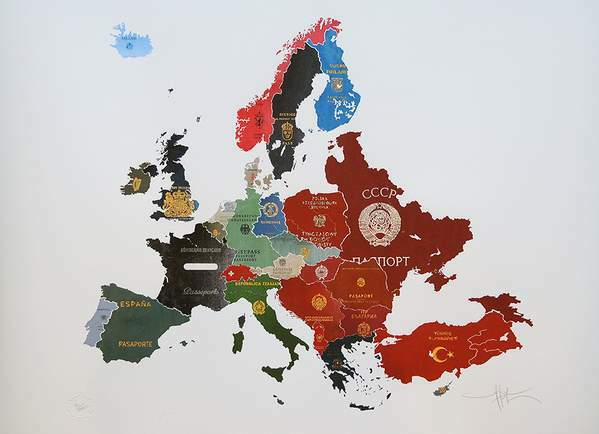 The last passport map shows Europe during the cold war (1960s). Look at Germany divided in East and West. 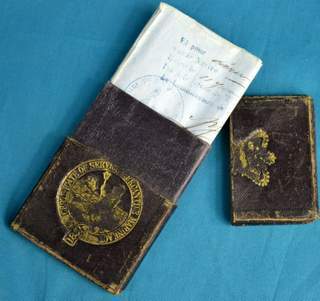 The West German passport cover as displayed here was actually not anymore in use in 1960s. Please visit Yanko´s website at http://www.yankotihov.co.uk/ to get even a better impression of his artworks. I enjoyed reading about his passport series and seeing the maps which are at sale in limited edition. I am sure you will enjoy another perspective on passports as well.